Thanksgiving -- a day consumed with carefully preparing family recipes, dusting off the fine china and juggling family politics. Like it or love it, we all go through with the preparations in hopes for one special memory that will bring us closer together. But will it really work? No one can successfully give and receive under holiday pressure unless they are already at peace with their own situation. At Tarot.com we have an annual tradition of encouraging our employees and members to prepare for this day with clarity and intention. Our secret recipe? A Peace & Harmony Celtic Cross Tarot reading. 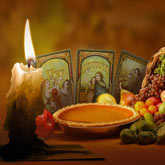 In the spirit of giving thanks, we're offering our popular 11-Card Peace & Harmony Tarot reading at 50% off. It doesn't matter if you're smack dab in the middle of the chaos or you have a few hours before the festivities begin, you can use this reading to quickly turn your anxiety into peaceful clarity. Each card acts as a key ingredient in your recipe toward a more meaningful day with family and friends. Start your new holiday tradition of clearing your mind and preparing your soul with a Peace & Harmony Tarot reading (50% off!). Or, if you'd like this healing recipe without paying anything, try using our TrialPay partner offer.